You’re going to see an amazing amateur boxer shown the way by a very well-schooled professional fighter. "And I will knock him out - believe you me, I will knock Oleksandr Usyk out in the mid-to-late rounds. "He's amazing at what he does. Unbeaten, hasn't tasted defeat as a professional, has tasted defeat on the amateur scene only a handful of times in over 200 fights," said Bellew who previously held the WBC cruiserweight title. "I was on the same amateur circuit as him and have sparred with him. He's fantastic, formidable at everything he does. 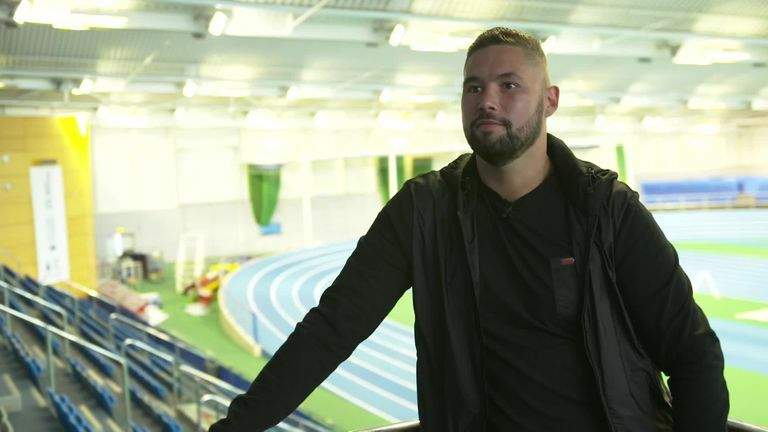 Bellew: I'll prove you wrong again! "But he is the perfect amateur - I don't believe he is the perfect professional. "This is a fight between two small heavyweights, and you're going to see an amazing amateur boxer shown the way by a very well-schooled professional fighter." Usyk will return to the UK where he won a gold medal at the 2012 Olympics - since then he has accrued every major cruiserweight title and the inaugural Muhammad Ali Trophy for winning the World Boxing Super Series in a total of just 15 pro fights. "[He is] the biggest challenge of my career because he is the ultimate fighter," Bellew said. "He is stylistically my worst nightmare, a southpaw. "He's got a fantastic work-rate and he's slightly bigger than me. He's younger. He's fresher. He's the monster that nobody else wants to go near. "I believe he's a future heavyweight champion of the world, as well. But I just believe I can beat him. I know I can beat him." Bellew won a world title two-and-a-half years ago in his 30th fight and has since defended it once, before successfully debuting in the heavyweight division with consecutive stoppages against David Haye. Yet he is still an underdog for Usyk's visit, and said: "Respect doesn't do anything for me. I have the respect of my peers which is the most important thing. "I'm trying to do something that nobody from this country has ever done before - hold all the belts, and The Ring magazine belt. "I'm daring to be great, risking everything for a dream that only I can see. "He's an amazing fighter. He's the best cruiserweight in the world. He's the best cruiserweight since Evander Holyfield - and everybody says I can't beat him. "He called my name, and I always answer the phone. I'm going to take on the impossible. "Keep telling me that I can't do it. Absolutely nobody gives me a chance, but nobody ever gives me a chance! "I was never supposed to win at Goodison Park, I was never supposed to beat David Haye, and I'm never supposed to even be in a ring with a man for all the belts and all the marbles. "I've got nothing to lose. I've secured everything that I wanted to secure. I've been a world champion. "This is something that could only have dreamed of doing when I got into this sport, and something that I did dream of doing but didn't think it would ever be possible. It's a once in a lifetime opportunity. "My final message: keep writing me off, and telling me that I can't, because you've been telling me for years, almost my whole career. In this one, I'll prove you all wrong again."